Home » Senior Recreation » Hobbies » Gardening Stools for Seniors to Make Working in the Yard Fun Again! Gardening is a great pastime for seniors. Tending to a garden with a wide variety of plants during warm months gives them great outdoor exposure, fresh air, and important nutrients from the sun. It also gives them a great sense of accomplishment when they can finally harvest their crops or see their flowers/plants grow. It’s a perfect hobby for people of any age, but especially for seniors who need some outdoor exposure and don’t like to go far from home. Does the senior in your life have a green thumb? Check out some of these awesome gardening stools you can get them to really enhance their gardening experience. Gardening stools provide a lot of support, and relieve a great deal of arthritic knee and back pain that can come with hunching over crops for hours. There are all kinds of gardening stools, from rollers to seats to foldable kneeler/chair combinations. Read on to see which one would work best for your needs. 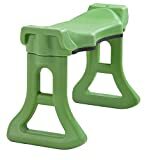 It may look a little childish, but the Step2 Garden Hopper is actually the highest rated garden stool on Amazon and a best seller. 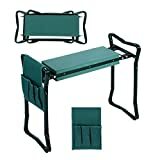 It’s straightforward and easy to use, as a mobile 2 in 1 gardening seat and storage area. This gives you easy access to your tools while gardening, while giving you the comfort of a molded, contoured seat, and even a cup holder! The seat also has a build in handle hole for easy transportation. The wheels are great for outdoor maneuvering, coming in at 7 inches tall. It holds about 250 lbs. And has a sturdy double wall construction, although it looks a bit flimsy. It’s perfect for seniors because of its versatility, all-in-one function, and great seat that would relieve pressure on knees, but still allow them to roll around to different parts of their garden without issue. For a slightly more industrial rolling seat, check out Pure Garden’s rolling seat scooter. 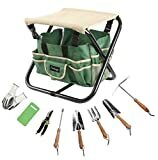 Instead of a storage case, it comes with a 12” by 16” tool tray to store your gardening tools and give you easy access to whatever you may need. It’s heavier than the Step2 Hopper, and not necessarily as portable, but it still gives you great mobility with 3” wide, sturdy wheels and sits you higher off of the ground (13”). It’s also cheaper than the hopper, even though it’s slightly more sturdy. Either rolling garden stool is great for seniors who want mobility and relief on their backs and knees. This gardening seat is perfect for seniors for many reasons. It has a comfortable seat with a contoured cushion, and the contoured “U” design provides maximum back and hip support, as well as comfort. You can easily adjust the height of this seat to your unique desired height. What makes this seat unique is its rocking function, which may initially seem unstable and not great for a senior, but it actually gives you a lot of mobility, and is better on hips and knees than a standard stool because it allows the muscles and joints to move around fairly often while working in the garden. This all in one tool is perfect for any senior who is just getting into gardening. It gives you literally everything and anything you’d need in a garden of any size, including a tote bag, 5 chrome steel tools, a pair of pruning shears, a pair of work gloves, and a foam kneeling pad. Best of all, it all fits inside a foldable, portable canvas stool with a heavy duty metal frame. You can check out more senior-friendly garden tools in this guide. It has 1 large compartment underneath the stool to house all of your tools and easily access them, and also has side pockets to house them as well, if you’d rather. The versatility of this gardening stool is unmatched, and it’s great for seniors who want it all. STURDY&HEAVY FOLDABLE STOOL: Heavy duty metal frame and durable canvas seat pad. A safety strap at the bottom frame to ensure the sitting safe. Trying to use a chair to make gardening easier on your back and hips? These two-in-one seat and kneelers are also perfect for seniors because they can work on their knees if they feel the need to, but can take a break, simply flip it upside down, and use it as a seated stool when they need to. This particular combination product is great because it’s incredibly lightweight and easy to flip, but can easily hold 250lbs. It has a steel frame and rigid construction, and also comes with 3 side tool pouches for easy access to what you need while working. This one is arguably even better for seniors than the previous pick, even though it has the same design. It has an oversized contoured comfort seat, which also acts as an oversized, comfortable knee pad. At the front of the model, there is a rocker function, similar to the rocking seat, to give your knees and hips some movement while keeping you stable and allowing you to easily reach far away plants or areas. The handles on this kneeler/seat are also softly cushioned, which is important when getting up from your knees. This feature puts much less pressure on seniors’ wrists and hands. It comes in either green or blue to match your outdoor style as well! 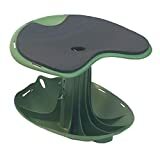 My pick for the best gardening stool for seniors would be the Vertex Garden Rocker Comfort Kneeling Bench . It has all the features you could ask for, short of an actual tool set. You should still review the choices above though, and see what would work for your unique gardening hobby and practices. 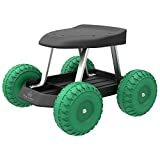 If you need mobility help getting to your garden, check out these rollators for outdoor use. These rollators have bigger wheels and are easier and safer to maneuver over uneven ground. Another idea to consider are raised garden beds that can be worked from a wheelchair. Gardening provides a great sense of the outdoors, peace of mind, and a great feeling of satisfaction when harvesting your vegetables or seeing your plants grow. Ths is one reason that gardening is a very popular hobby among seniors and the elderly. If you or a senior you know is thinking about getting into gardening, try out some of the stools above and get to digging! Do you have any more gardening tips for seniors in particular? Please share them with us! If you found this guide helpful, please share on your favorite social media!